Remington Park is a horse racing track and casino located in Oklahoma City, Oklahoma. Built in 1988, it was the first world-class pari-mutuel track in Oklahoma. Remington Park was built by the late Edward J. DeBartolo Sr., the shopping mall developer who also owned Thistledown in Cleveland, Ohio and Louisiana Downs in Bossier City, La. at the time. Remington Park is now owned by Global Gaming RP who purchased the facility via auction in 2009 from Magna Entertainment Corporation. Global Gaming began operations at Remington Park on January 1, 2010. In 2009, the Horseplayers Association of North America introduced a rating system for 65 Thoroughbred racetracks in North America. Remington Park was rated as the #3 according to HANA. The track features an American Quarter Horse, Paint and Appaloosa season in 2010 from March 5 to May 31. The Thoroughbred season begins August 19 and continues to December 11 in 2010. The main dirt track is one mile in circumference with the inner turf course measuring seven furlongs. Remington Park made headlines upon opening on September 1, 1988 for its use of a synthetic surface for its main track called Equitrack, which utilized grains of sand coated with a wax polymer. The intent was to provide a safe all-weather racing surface that would be provide a fast condition for all races. Alas, the Equitrack experiment failed as the surface did not hold up during the very warm Oklahoma summers. Remington Park replaced Equitrack with a more traditional natural ingredient racing surface. No other American track used a synthetic surface until 2005, when Turfway Park installed an improved product called Polytrack. Remington Park now includes a casino with 750 slot machines. Remington Park hosts the richest race in Oklahoma, the $1,000,000 Heritage Place Futurity on May 29, 2010. 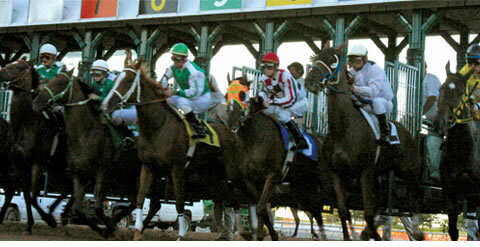 The $400,000 Oklahoma Derby headlines the Thoroughbred season on October 10, 2010.